This picture is pencil and charcoal drawing. Thank you for your nice words. I 'm pleased you like it. I love what you did with shadow and carmina/sepia tone, it's just mind blowing. I just love her dress! It's perfect! I can almost feel how light and flowing it is. Thank you, I'm pleased you like it. Love the poem and the drawing is amazing and everything. Sorry if I missed your note. I'll have to check when you sent it out. Thank you. I'm pleased you like it. No do háje... to je parádní. Stínopvání, póza... super. Thank you for your lovely words. I'm really pleased you like my work. Her hair is full of stars! Oh the loveliness! Glory supreme! What a wonderful piece of art work. Sadly, I don't recall what Luthien exactly looked like but I love this picture and think that Tolkien would improve. 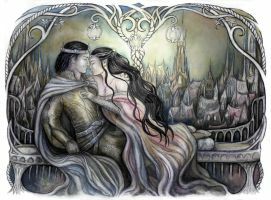 Did you know that Luthien was invented after his own wife? And on his wife's grave is Luthien (under her name) and I think Luthien's husband was Balin or something right? Or was that a dwarf from The Hobbit? Now I'm confused, lol. Anyhow, Luthien's husband's name is under Tolkien's name on his grave since he really made up the story based on them since they had their own forbidden love story due to Tolkien being a staunch Catholic surprisingly enough (since he wrote such awesome fantasy with gods and monsters, for example) while Tolkien's wife, Eddith I think, was a Protestant or something. As you can imagine, they were forbidden from seeing each other since the times they lived in were still rather backwards. Then Tolkien went to the war (forgot which one shamefully) and only marrie Eddith a while later. Sorry for rambling but I couldn't help it since the picture is very awesome and I didn't know how many people actually knew about how Luthien was created. Stupid though since some probably do so I'll shut up now and fave the picture since it definitely is worth it. ... yes I already knew that. And yes, Balin was a dwarf and Luthien's husband was Beren. I'm happy that there still are people who are interested in Tolkien and his work. Ah! Right. That was his name. I couldn't remember it for the life of me and I was so annoyed with myself. Anyhow, I am a huge fan of all things Tolkien since it was the first fantasy book/movie I have ever seen and read and certainly the best. In fact, I think that Tolkien was the founding forefather of fantasy in so far as I'm concerned, lol. All others are poor copies and shadows of his works. Some better than others of course.